Usually, all of us know that physical activity and exercise are essential but unable to fit them into the daily routine suitably. If such is your problem, you are welcome here to encounter it. Most of us do not exercise at all. A survey conducted recently found that only 5% of people worked out thoroughly in the last 24 hours. Lack of time is the sole reason felt by individuals as they are busy in the day to day routine of working. People do not give much importance to undertake regular exercise or physical activities. 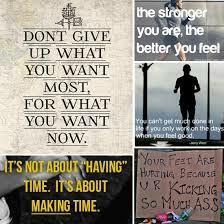 The excuses vary a lot like: They are unable to find time for the workout. They have to take care of kids, have to go here and there for various chores, they have to go for their job. They have to meet neighbors and last of all they have to catch up on their sleep. There are many such reasons, causes to excuses that the necessary exercise can not get completed. 1. It helps in the maintenance of healthy body and weight. 2. It helps in maintaining blood pressure and sugar level. 3. The muscles, bones and joints remain in the healthy stage, and the aging process slows down. As per Center for Disease control(CDC) the adult must exercise lightly, such as light aerobics or brisk walk for at least 150 minutes per week. OR they must exercise for 75 minutes vigorously like running every week. Besides this, they should work out to make the muscles strong, or particular activities to concentrate on a particular area of the body. The hardest step is to find the opportunity when to begin, you must think of a reason that can impel you to start the exercise. Some people find this reason only when a physician writes in the prescription, that if you do not exercise you will get a severe disease. Other find the reason, wanting to look smarter or enhance the athletic capacity, or want to get free of stress or just join the exercise group for light entertainment. It is simple, find an inspiring reason and get ahead to lead a fuller and happier life. 1.Give importance to doing the exercise as if it is as important as brushing teeth or doing any essential job. With this importance in mind, you will automatically get the time. 3. 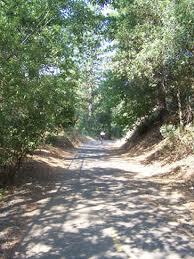 Wherever you go for the exercise, you should use a cycle or walk to the place instead of driving down there. Or park the car at a ten minutes distance and from there walk briskly to the place of exercise. Do not use the elevator but use stairs. Begin with some light stretching. While watching your favorite program, you start cycling and in between laugh loudly. Occasional, peals of laughter get all the benefits of heavy breathing. The carbon dioxide is out, and regenerative oxygen is in. 4. Regular exercise release hormones that keep the mood in good status, the worries, pain and miseries and stress remain under one’s control. Let us start today itself for the exercise mission. This is perhaps the most overlooked and neglected form of exercise. Because it sounds and look natural, most of us do not bother to walk, but prefer to sign up for expensive aerobic classes and spend a lot of time in a gym. We recommend walking as exercise since it costs nothing, requires no partner and costly gadgets, but will burn nearly the same calories as jogging does. It does not burden the body, instead if done in calm and peaceful surroundings like a park or country road, it will let off the tension in your mind and body. Make sure you do not eat an hour before going out for a walk. Digesting takes a lot of energy from the body. If you exercise right away after eating, you are going to overburden yourself. Fruits or juices are okay since they do not tax the system as much. Exercise alone will not make you healthy. No amount of walking or jogging will help the body if you do not eat properly or have the greater affection with cigarettes and alcohol. It does not matter when you do it. Although we acknowledge that an early morning walk is better because the air is significantly fresher. For people who only have the afternoon to do it, it is okay. Avoid busy roads. You need fresh air with green & clean surroundings. The aim is to relax the mind, as well as exercise the body. If you are taking more carbon dioxide than oxygen, you are harming your body. So, find a beautiful, peaceful and green place. The human body is designed to walk, no one should be taught how to do it. However, for walking as exercise to give more impact, this is our recommendation Get at least 30 minutes walk every day. Keep your pace at 3 to 5 miles an hour. Vary your routes so that you are not walking on flat ground. If you cannot maintain the brisk pace, this is what you should do. Alternate between a 2 minutes brisk walk and a more comfortable pace for the next 2 minutes. After that 2 minutes “rest”, pick up your pace again. If you can maintain the brisk walk, do it for approximately 20 minutes. If you cannot allocate 30 minutes a day, don’t worry. The most important thing is to do it regularly. Walking as exercise will restore your peace of mind, make your blood pressure normal and control your appetite. It is better than any pills invented by mankind. Walking four times a week, 45 minutes each time, the average person can lose 18 pounds in a year with no change in diet. Walking can help you trim fat as well as tone your muscles. Walking, at any level or speed, two or three times a week for at least 20 minutes increases cardiovascular strength. By increasing the strength of your heart and lungs, you increase your ability not only to exercise longer and harder but also to perform everyday task without tiring. As with any endurance activity, walking doesn’t significantly increase your flexibility. Every activity uses certain muscles groups more than others. Therefore, you don’t stretch the muscles that walking uses extensively. They’ll tighten, straighten and perhaps cause pains or strains. These exercises are vital for remaining free injury. All walkers develop a moderate amount of endurance, which enables them to exercise longer before becoming exhausted. Race walker has high endurance comparable to that of marathon runners. Walking helps build your ability to do something longer without fatigue. You will gain muscular strength with walking but probably not enough for a well-rounded fitness. Muscles that get an extra workout in walking include the entire back of the leg, calves, hamstrings, and gluteus. You will use muscles of the back of shoulders when you swing your arms. 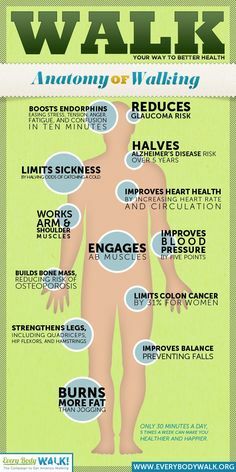 Walking provides other physical benefits and prevents dangers associated with other types of exercise. Walking is a low-impact exercise, which puts less strain on bones and tissues. It works to build fitness, slimness, and cardiovascular health and helps with relaxation. Taking a walk is one of the best things you can do for your back. It promotes muscular development, increases circulation, and speeds up the release of endorphins that provide a natural “high”. As we get older, there is a gradual decrease in skeletal strength, the mineral content of bones’ decreases and their texture becomes thinner. And because the bones are too porous and brittle, they are more likely to fracture. This condition is called osteoporosis. Calcium and exercise are the keys to the prevention and treatment of osteoporosis. Walking may help you combat it. It is the easiest and safest form of exercise for people of all ages. The studies show that a walk of just half an hour, four times a week, can help prevent osteoporosis. It has seen that the people who are active and fit are not so likely to smoke as those people who are sedentary and less healthy. Although walking does not stop people from smoking, the routine of walking can be applied as a positive habit to replace the harmful habit of smoking. In order to improve your general health, you must find the willpower to stop. Smoking causes feelings of fatigue because it impairs the delivery of oxygen to the cells of all the body’s organs. It destroys vitamin c in the body, weakening the immune system and increases the amount of carbon monoxide in the bloodstream, leading to heart and lung disorders and cancer. Decrease your intake of alcohol and caffeine. And make sure your diet is low in salt, sugar, and fat. Cholesterol is present not only in the blood stream but all of the body’s tissues. Most of the cholesterol in the blood stream is in the body, but some foods that we contain cholesterol (Dietary cholesterol). Cholesterol gets transported in the blood by lipoproteins. There are two types of lipoproteins – High density (HDLs) and Low density (LDLs). HDLs sometimes are called “good” and LDLs “bad” cholesterol. The higher your HDL level, the lower the risk of heart disease. Stress can also affect your cholesterol levels. Regular walking can increase the levels of “good” cholesterol in the blood, reducing chances of a heart attack. So try to avoid stress – and relax. Go for a walk. Regular walking may reduce the risk of a heart attack by half. It can help to lower the risk of coronary heart diseases as there is a link between vigorous physical exercise and a low incidence of heart failure. Although regular, vigorous exercise can reduce the risk of developing coronary heart diseases, it cannot provide immunity. So many other factors have to be considered. And another way in which you can help yourself is by having a healthy and balanced diet. The treadmill works using a wide conveyor belt and an electric motor so that you can run or walk indoors while staying in one place. The more expensive, heavy-duty treadmills tend to be motor-driven. The cheaper, simpler treadmills work by passively resists motion, thus moving when you move. The treadmill is an alternative to outdoor running. While some people mayjust prefer the consistency and steady environment of running indoors compared to outdoor running, others choose the treadmill for many select the treadmill for different reasons. Treadmills mimic an exercise and movement that is familiar and comfortable.
. No excuse to avoid running. Often, outdoor running is not possible for diverse reasons such as foul weather, traffic pollution, uneven road surfaces. Poorly lit/unlit streets or very busy neighborhoods with little space for runners, dangerous areas or unwanted attention. .Safety and security is another and common reason for many, especially women running alone. Running alone, particularly in the dark is less than ideal.
. Most treadmills possess some degree of shock absorption and reduce the impact of running. Thus, treadmills may reduce strain and stress on joints including the ankles, knees, and lower back.
. As with running outdoors, treadmill running will increase endurance and cardiovascular fitness and facilitate weight loss or weight maintenance.
. Privacy. If you are self-conscious and do not want to join a gym or run outdoors, having a treadmill at home can solve most of your problems.
. You can multitask, as you can do other things while exercising, such as watching television.
. Able to control your training conditions with more accuracy – slope/ incline and speed. Calories burned may be more accurately calculated.
. Some treadmills calculate step count, heart rate and number of calories burned.